The BX-Trigger® is a light, crisp, "drop-in" replacement trigger assembly that is compatible with all Ruger® 10/22® rifles and 22 Charger™ pistols. 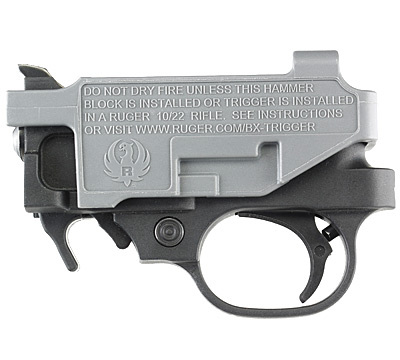 The BX-Trigger® is a Genuine Ruger Factory Accessory and is the perfect upgrade for all 10/22® rifles and 22 Charger™ pistol models because of the significantly reduced pull weight of approximately 2.75 lbs. (versus 6 pounds on the standard 10/22® trigger). The BX-Trigger® is sold as a complete assembly that drops in to replace the existing trigger assembly. A video of the installation process can be found at Ruger.com/BX-Trigger. What a difference! Installed it on my target rifle, and on a standard rifle. So easy to install, only takes about 20 min. from start to finish, that even a cave man can do it! This is 20 times better than the factory trigger in your 10/22 rifle. The pull is light, the break is crisp and the reset is both tactile and audible. If you are serious about shooting cloverleaf groups this trigger will make it possible. Your 10/22 is accurate already, this trigger helps eliminate movements while you fire each shot. The pull is great and consistent. Bought mine a year ago , works great , The only problem is after about 400 rounds the bolt lock back lever Does not release when I rack the slide . on my 10/22 . I have to Jiggle the release lever to close the bolt . It worked GOOD for the previous 400 rounds ???????????????. I bought one of these with a gift card. I installed it on my 50th anniversary takedown and it made the rifle fell like a new gun. It compares quite favorably to the Geissele SSAe that I have on my AR-15 and LR-308 as far as the smoothness of the trigger is. I need to get another and install on my 2nd year of production 10/22. Why do I have to buy? I bought one of these and am very please with it. Some here say that it compares to a KIDD, no, but it does not cost like a KIDD either. Another thing, people want to know why this does not come stock in the 10/22. Liability. This is a owner add on after market item so Ruger is not responsible for its use. If it was put in as the standard trigger, the liability would put Ruger out of business overnite. The product does what it was designed to do, and does it well. Easy to install. Takes no more than 10 min. I have one on a target rifle, and one on a standard 10-22. Should come with THIS trigger! This wasnt difficult, but not so easy for a novice as some here imply. Need better close-ups on the video and some things were skipped that needed explanation --those pins were in crazy tight, not easy, like on the video -- again a little more explanation, for a novice -- you old hands Im sure this was nothing. The size punch needed in diameter and length would have been very helpful. I borrowed a punch but it wasnt nearly long enough and the pins were in tight -- had to use a makeshift item to get the pins out all the way. Ruger, remember there are always newbies! Test with someone who has never taken any gun apart! Itll open your eyes! PLEASE switch over to these triggers -- 6 lbs is FAR to HEAVY a trigger! Ive only done a couple dry-fires per the testing instructions and while I had the test block on the trigger -- feels great. Hoping I see happy results. The 1022 Sporter that I purchased was great in every detail except the heavy trigger. I wasted a lot of time trying to convince myself the BX Trigger would be an improvement. When I finally purchased one it was hard to believe my Sporter was the same rifle. It was simple to change out the original trigger for the new BX. The BX trigger was smooth and had a light, crisp pull. My accuracy improved immediately. By far the most significant improvement to be made to the quality and enjoyment of the 10/22. Simple installment; should be standard on all these rifles. When you order one, consider purchasing the hold-open plate too---both of these will make your Ruger a great firearm and more pleasant to handle. A friend gave me one of these for Christmas for my very old 10/22. It works so much better than the original and I love the mag release. Wish they made one like this for the old ruger 44 carbine from the early 60s. Thats a great deer gun. I may have expected too much. The assembly is convenient and simple to install. While it is an improvement over OE its only minor. Excessive over travel and a mushy break relegate it to second class standards. Perhaps mine is defective? I cannot recommend the BX-Trigger at the current price point. Out standing trigger for my 10/22 rifle. works in my 10/22 mag also. The title says it all. Recently installed this trigger on my 10/22. Much lighter but not very crisp. A lot of overtravel. Needs a stop. The Clark Custom job I had done on another trigger is much better. If youve cleaned your 10/22 before, the install is super easy. I have only dry fired the BX so far, but I was slightly disappointed. The pull is very light. I was expecting a 40 - 50% reduction but it feels like a 65% reduction. Too much? It is VERY smooth. And I dont like the end of the pull which has a constant force instead of a properly ramped force. Dropped one of these in my 50year edition 10/22s last year and the trigger pull is smooth as silk. Great upgrade! No way to identify which is the BX Model when the original and BX model are side to side. others have said its on par with a KIDD trigger, thats just not true. my KIDD has a 3oz/6oz two stage trigger. Yes i said OUNCES. at 2.75pounds the ruger would be 44 ounces. The Ruger BX and the KIDD triggers arent even remotely similar. If you want a good trigger for plinking or hunting and not spend much the ruger is great but if you want to build an ultimate bench 10/22 where accuracy is the most important thing then the KIDD 2 stage is the way to go. The Ruger BX-Trigger is simple to install and cut the breaking weight in half of the standard trigger in my Collection Series 10/22. It is crisp and has no noticeable creep before breaking. I owned numerous automatic rimfire rifles for over 50 years and this includes many costing three times the cost of my new Ruger 10/22. Some had fine wood stocks and mirror finished bluing. Some were highly customized and beautifully made rifles. Few shot better than a Ruger 10/22 carbine. However, many shot worse. There is nothing wrong with the standard 10/22 trigger making it beneficial to new shooters. For the money, this trigger is a bargain. Light breaking triggers do not make expert shooters, careful practice and determination does. Bought a Charger parts gun minus receiver and trigger, found a Charger receiver for a great price and built one from it. Needed a trigger group so instead of buying and overpriced aftermarket one I chose the BX. Was not a disappointment, and am very happy with the trigger pull especially for a pistol 10/22. Will be buying more for the rest of my Charger and 10/22 collection. Thanks Ruger! I recently bought this trigger group through the ShopRuger website, to use a 20% discount that came with a Take-down 10-22. The discount covered the tax and shipping, so that was OK. This trigger is smooth and crisp, and MUCH better than the stock trigger, which has more creep and is slightly mushy. I bought the 10-22 on sale, so the lower price essentially covered the trigger group upgrade and then some. We have another 10-22 with a V********n trigger group that cost 2x+ as much as the Ruger BX. Yes, I can feel a slight advantage with the V, but it is on a modified target piece with too much money in it. The Ruger BX is an excellent value for a field and fun gun. What took so long to bring it out, Ruger? Maybe patents expired? This was what i needed for my 22. Improved my accuracy overall. Well worth the money. 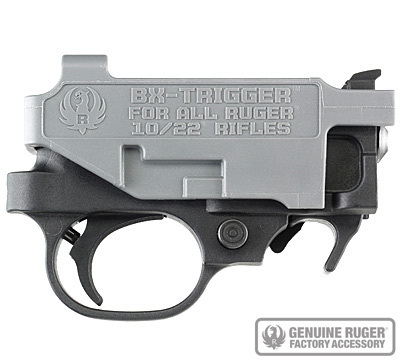 This is a good trigger, on par with the KIDD trigger kits, but it begs a question....why doesnt Ruger just sell the 10/22 with THIS trigger? Isnt it pretty much saying that there is a problem with their production triggers? Picked up the 10/22 Take Down. The trigger pull was six pounds. Installed the BX-Trigger which took the pull down to three pounds. Excellent . I also installed a set of aperature sights. The thing is a tack driver. Got one for my Target rifle. Checked it with my trigger pull gauge, and get a 2.75lb pull every time. It is, what Ruger says it is. Mr.Bill would be very happy! Was very easy ti install. Have only dry fired but Im sure I will not be disappointed at the range. May receive one other bonus as well. Have bothersome FTE about every 30 fired rounds. Wondering if that problem will disappear. Note: save original trigger in grey trigger guard and save with other original parts in original box. Your great great great grandchildren might appreciate that. This is a outstanding trigger. Bought one for my 50th. Anniv.10-22. Liked it so much that I bought one more for my 22 Charger. Super easy installation, about 5 min. Start to finish. Yay , Ruger scores another home run. I installed the BX trigger assembly in my 10/22 Takedown Model today. Took about 10 minutes, being extra careful. I could do the next one in 5 minutes. My original factory trigger group was actually pretty decent, but the new trigger group is sooooo much better! Just a tiny bit of takeup on the front end, then the trigger breaks like the proverbial glass rod, with absolutely NO overtravel. Every bit as good as the high-end custom triggers made for the 10/22 I have shot, but nowhere near their cost. Was having problems with a new build using a trigger assembly costing triple the cost of the new BX trigger. I installed the new BX trigger and it cured all of the problems I had been dealing with. Im going to be buying several more. After dropping this in my 10/22, there was a significant improvement in accuracy. This is the trigger that the 10/22 should ship with. I put mine in in under 5 minutes on my 50th anniversary , my trigger gauge read a consitent 2.5 lb pull ten out of ten, if I slowed the pull to a creep I got a reading of 2.25 5 out of 5. Absolutely amazing, Im shooting sub 1 groups off a bench at 65 yards with a 3x9x40 scope!!! installed in minutes thanks to following the instructional video. Took it to the range today to put it through its paces. Wow! My accuracy improved and it was just more fun to shoot. installed the new BX-TRIGGER on my wifes RUGER TALO ITAC. Vast improvement for considerably less investment than the competitive replacements. Well done, RUGER! Just received my trigger module. It took less than five minutes to install. Great improvement over factory trigger. Kudos to your design engineers. Whoever came up with the try it before you buy it packaging for the BX trigger deserves a big raise in pay. Excellent idea! I installed this trigger today in less than 5 min. It fit perfect and the trigger pull in amazingly light and crisp. I will be purchasing one of these for each of my 10/22 in my stable. Thank you Ruger! Received the BX trigger from you and installed it in just a few minutes. Trigger has a light take up, then builds and breaks cleanly at 2lbs. 9oz.. on my Lyman gauge. The original trigger I would rate only 2 stars. Outstanding trigger! Have installed two of these in my 10/22s. My trigger pull gauge reads 2.75 to 3.25 lb. Great improvement. Am going to order another for my third 10/22! Excellent product. Simple to install, and my trigger pull is a measured 2.8 pounds now, instead of the difficult 6 - 8 pound original.